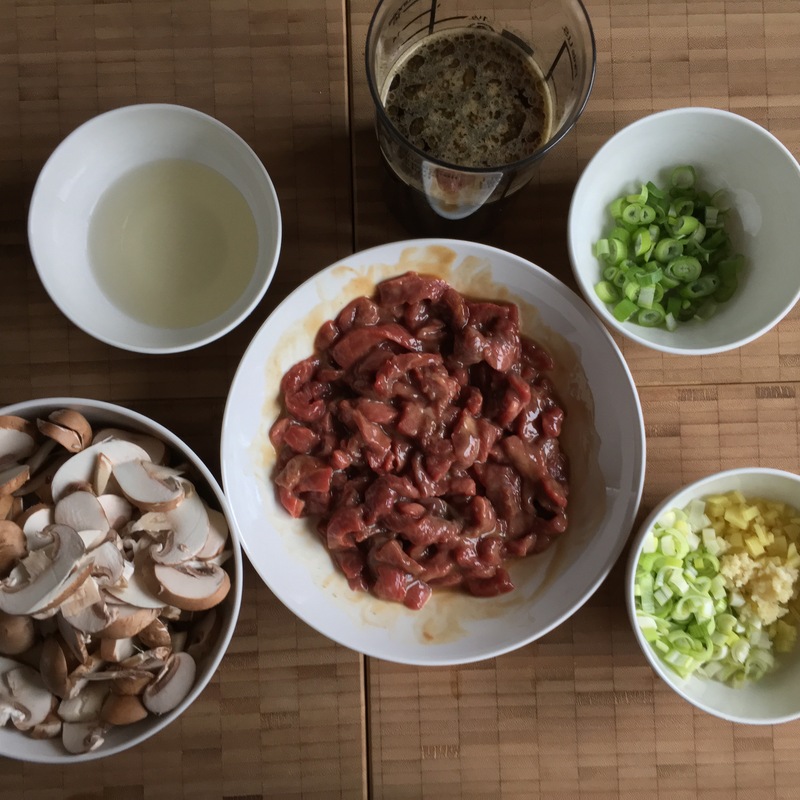 It’s quite a long time since I did some Chinese wok dish on my blog – nevertheless I do it rather often at home (well: not always using my big wok, but rather a deep pan…). 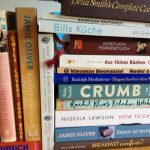 I like to read about dishes from the Far East on The Woks of Life as well as on Omnivore’s Cookbook. 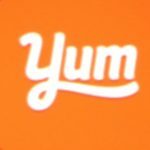 The recipes are based on the fact that in the Western hemisphere lots of Far East ingredients have to be found in a trusted food store especially concerning spices & herbs & special sauces. So you get the feeling of being genuine w/o having to harvest your very own soy beans & ferment them & let it mature… or trying to ransack your city’s food stores for any fresh original – Far East imported – special Chinese scallions. 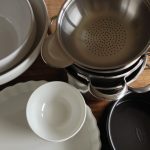 I read about an interesting wok dish recently – interesting because the lack of any of the usual suspects from the spice rack. Indeed there aren’t any spices at all – only some sauces. At the end of the day well get a hearty mess on plain white rice & it’s a perfect small weeknight dinner. 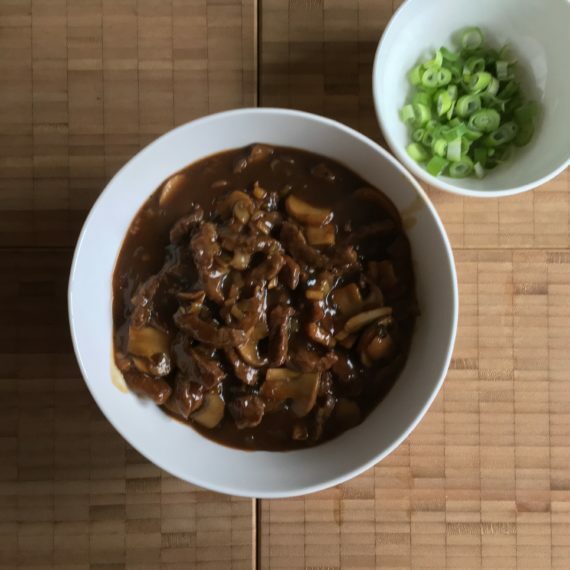 The combination of beef, mushrooms, spring onions, ginger & garlic is basic – I’m sure you may take carrots instead of mushrooms as well (or any other rather solid vegetable). 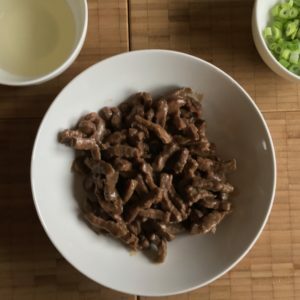 Well – „pure Chinese beef“: it isn’t a beef-only dish, of course there are vegetables, but it’s the lack of any spices that let me to the title of this post! …& a mix of soy sauces (light & dark), oyster sauce, sesame oil & ground pepper. The beef is cut into strips – I started w/ roulades so that the cutting was easy. Add some oyster sauce to the beef & let is rest until the wok session starts. 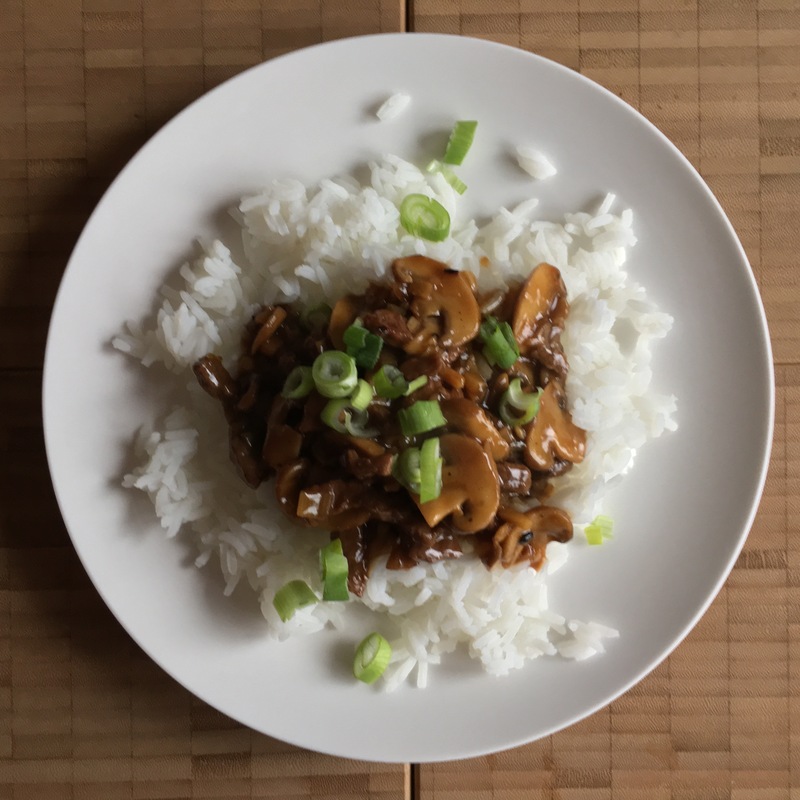 Afterwards chop the mushrooms – thin slices are fine. Chop the spring onions & set the green parts aside. Mince the ginger & press the garlic; add to the chopped spring onions (the white parts). Mix the sauces & set aside some dry white wine/dry sherry for the finishing touches. You may also use Shaoxing wine if available. 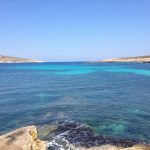 I think that dry white wine or dry sherry are a good replacement. Then grab your wok & heat some peanut oil until really hot. 1st batch in the wok is the beef. You’ll need to stir-fry for about a minute or so. 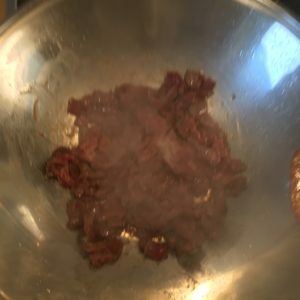 Afterwards put the beef in a bowl & set aside. 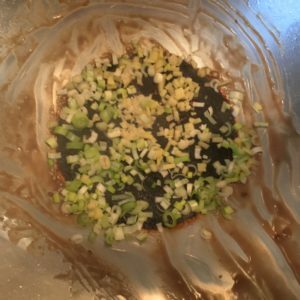 Dump the spring onions w/ the ginger & the garlic into the wok & stir-fry… If it seems a little too dry add a splash of water. 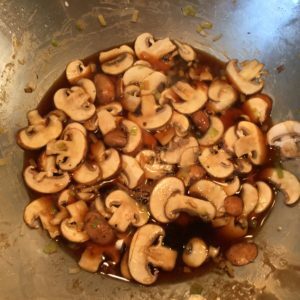 After about 1-2 min add the mushrooms & stir-fry… When mixed add all of the sauce mix. 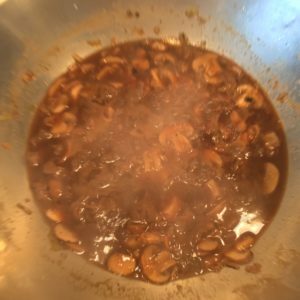 The mushrooms are now swimming in liquid – just stir & bring to a boil. Let it boil for about 5-10 min until most of the liquid is evaporated. Generally spoken: it’s ready for serving now! 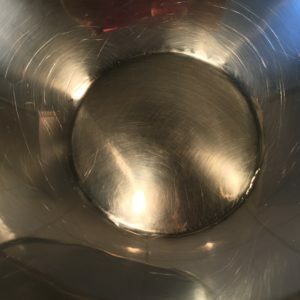 There is a lot of liquid – more liquid than usually when doing wok dishes. So you mix some water w/ corn starch (or any other starch) & add the mix – spoonful by spoonful – until it’s the thickness you like. You may also add some sesame oil at the end: it’s a nice flavor I like very much – but you need not. 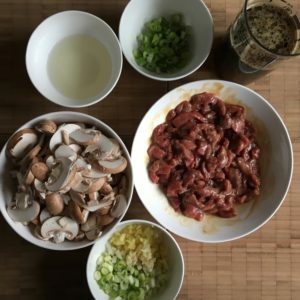 So there is now this wonderful hot bowl of pure Chinese beef w/ some mushrooms, some chopped spring onions for an additional kick & plain white rice. 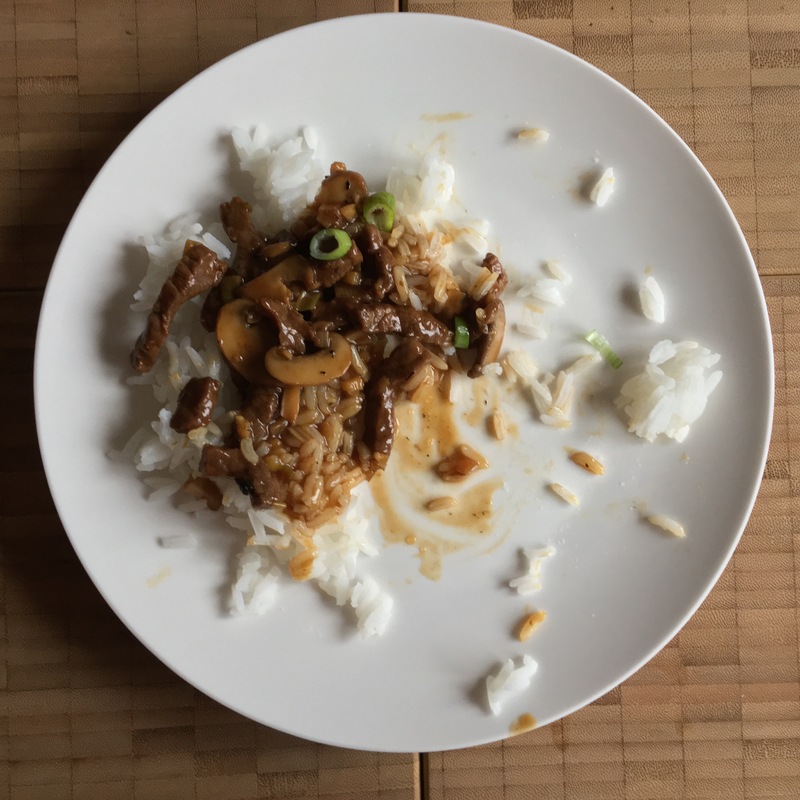 The rice… Either you cook the rice before the wok session or you grab some pre-cooked rice out of your fridge or freezer & let it reheat in the microwave while stir-frying. Once more a wok dish: this time no use of any spices - only soy sauce, oyster sauce, sesame oil, salt and pepper. Together with the beef a batch of mushrooms is stirfried in the wok. 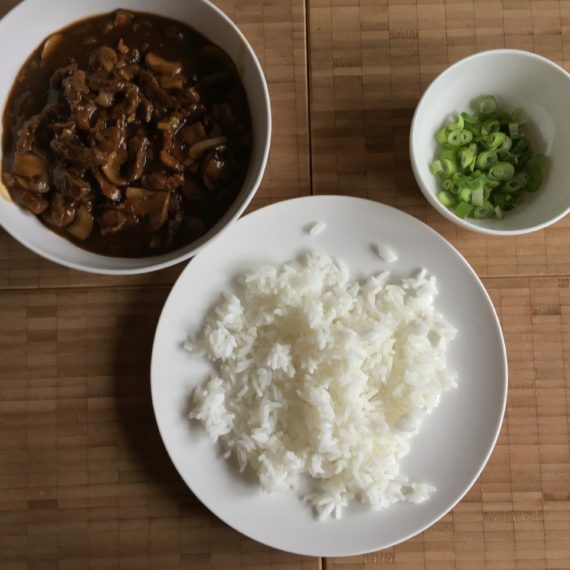 Altogether it’s best with cooked rice and it’s a dish quickly prepared. Prepare the cooked rice: either cook it in advance before starting the wok session or make sure that enough cooked rice sits in the microwave to be heated during the wok session. 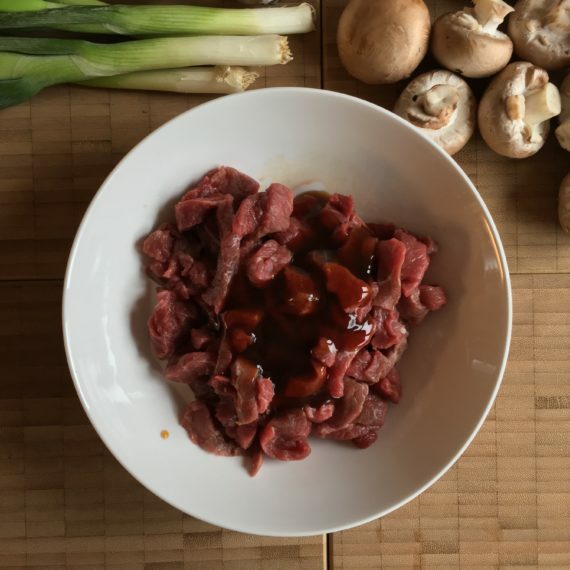 Cut the beef in strips; add the oyster sauce & let it marinate for some minutes. Mince the ginger, press the garlic & chop the spring onions. Set aside the green part of the spring onions. Chop the mushrooms into thin slices. Mix the ingredients for the sauce & add water; at the end you shouldn’t have more than 300 ml altogether. Prepare the wine resp. sherry. Take a wok, add the peanut oil & heat it up. When the oil starts jittering add the beef & stir-fry for about a minute. Put the beef in a bowl & set aside. Add the spring onions, the ginger & the garlic & stir-fry for about a minute. 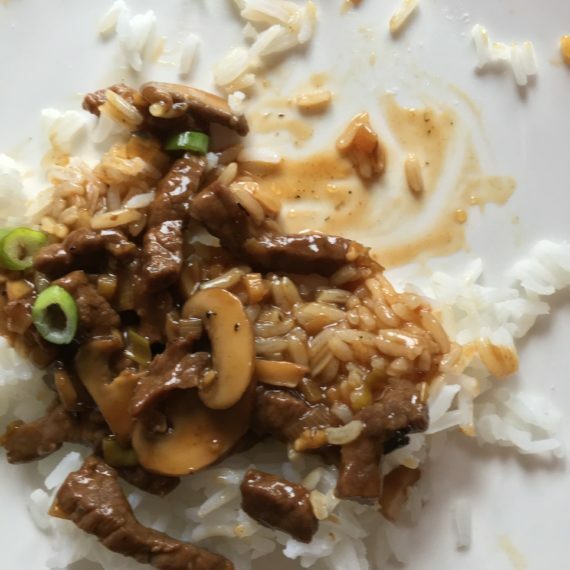 Add the mushrooms & stir-fry for another minute. Add the sauce, bring it to a boil & stir frequently. Most of the sauce shall vanish during the next 5-10 min when bubbling. Add the beef & the sherry resp. wine for the finishing. OPTIONAL: mix water & corn starch & add to the wok mess to thicken the liquid (spoonful by spoonful!). Prep Time: It is important that you prepare all the ingredients before starting the wok session. Cooking Time: It’s summed up the time for all the wok stir-frying. 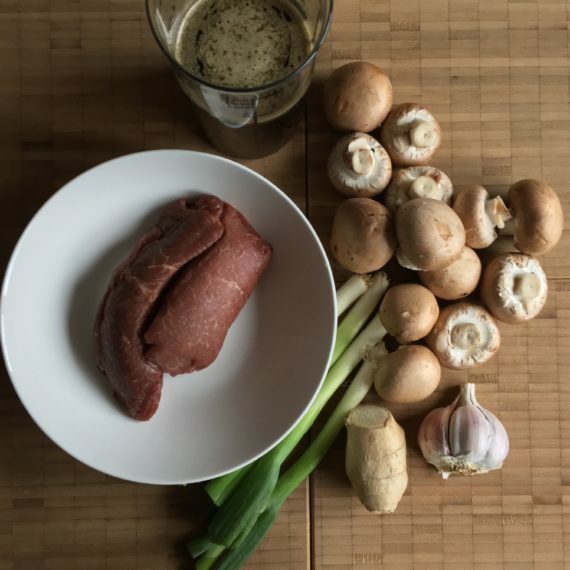 Beef: I used beef already prepared for making roulades. So I got fiel strips - easily. 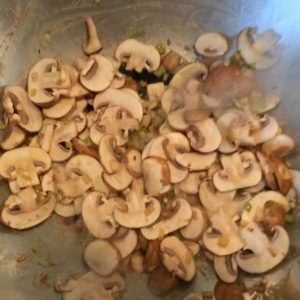 Mushrooms: You may also use thinly sliced carrots instead or peas. Sauce: Be careful w/ the salt. Always have in mind that soy sauce is rather salty from its nature. Sherry/white wine: You may - of course - also use Shaoxing wine if you manage to lay hands on it in your Trustes food store. Sesame oil: I like the note of sesame oil in a Chinese dish & mostly add some sesame oil at the end. You may skip this act of course. 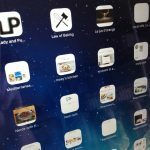 The dish may be stored in the fridge for 1-2 days & reheated in the microwave. All this ends up in the wok. The corn starch… I wasn’t sure from the beginning. 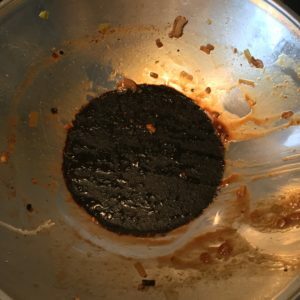 I’ve got a nice shiny wok – and then look at the disaster below! This happened when I started after having added a corn starch-water-mix to my beef. 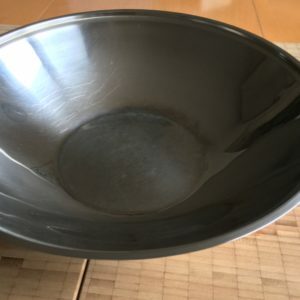 It was a tough thick crust on the bottom of my wok – & it took me time to clean it up. In my recipe I just skipped the corn starch-water-mix – and it’s fine. If you like to stay w/ the original recipes I recommend not to work w/ your wok, but to look for a deep non-stick pan. It is rather salty because of the soy sauces & the ground white pepper gives you a substantial kick. 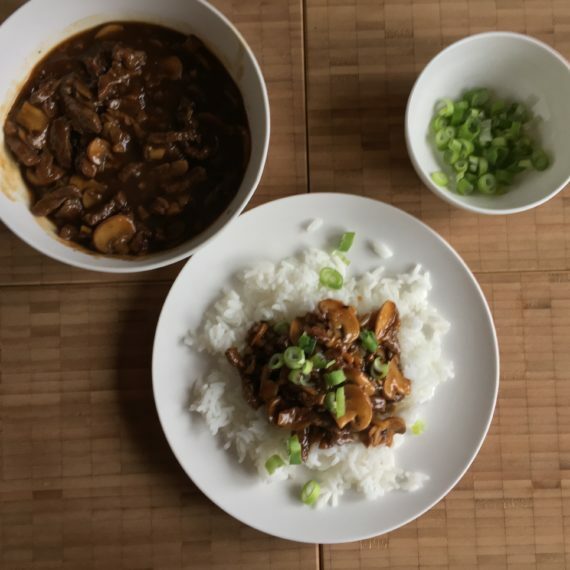 All the common Chinese spices are missing – but you won’t miss the typical Chinese impact. Overall you’ll need not more than about 30 min for dinner preparation… Is there any wish left?